Let's face it. Chances are if you use a BlackBerry it is because you want to get stuff done in the quickest time possible and with little hassle, right? What about if some things just got a little but easier? That is where Amplify comes in. The app is all about efficiency. 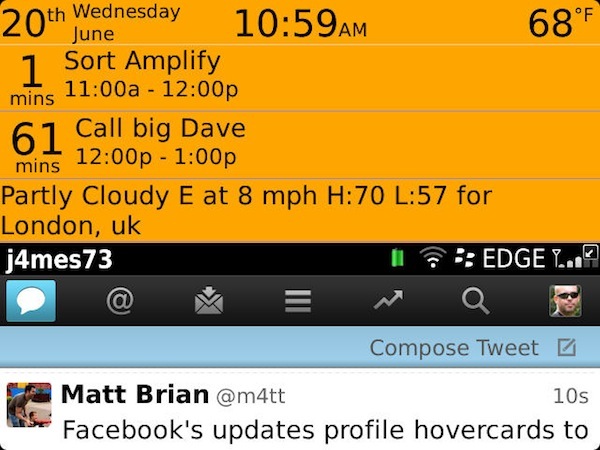 Imagine being in your email, Twitter or Facebook app but suddenly want to check your calendar for example. Amplify will allow that with a quick press of one of your hardware keys. Simple. Keep reading to see what Amplify has to offer. Getting started using Amplify is a piece of cake. There is a tour which can be taken which will explain how the app works and the options available to you. It is then a case of getting set up and making the tweaks that you desire. The most important option here is setting up your Hot Key. This is the hardware key you use to launch Amplify with a simple short press. You have the option to choose from your volume up, volume down, mute and the right convenience key. 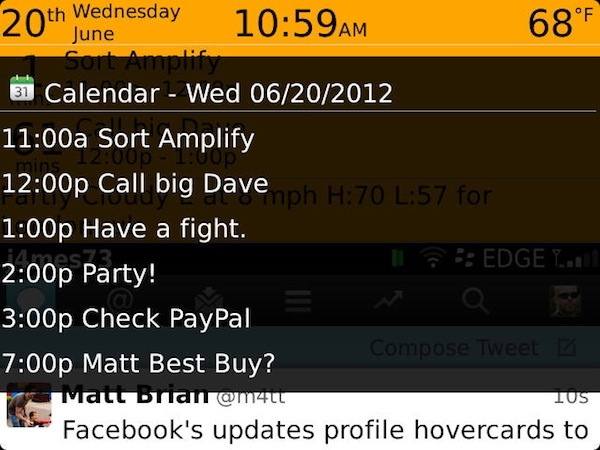 Clearly depending what BlackBerry you are using will affect the options available to you. 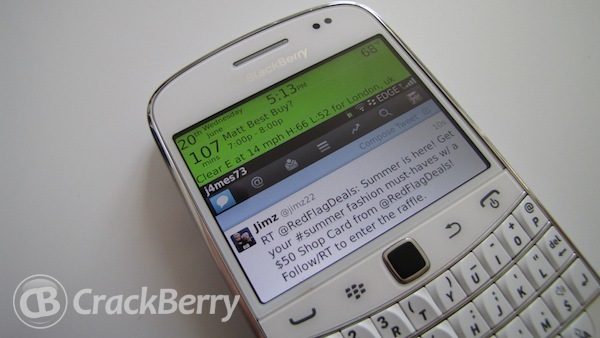 For example an older BlackBerry such as the Bold 9780 will have two convenience keys. I mentioned on the video that the status bar can be customized. 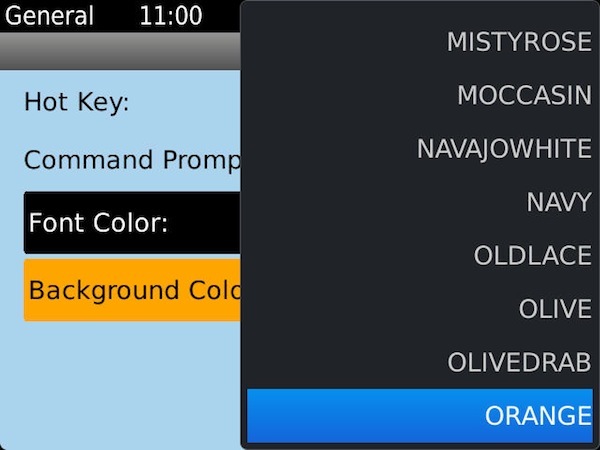 You can select from a HUGE range of colors for both the font color and background. 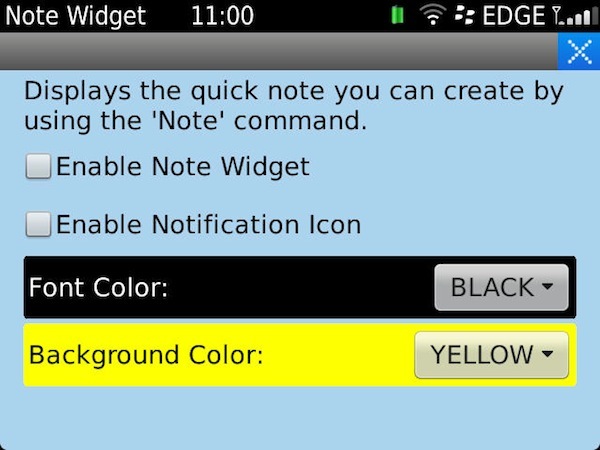 Again these color options also apply to the ‘Notes' option within the app. 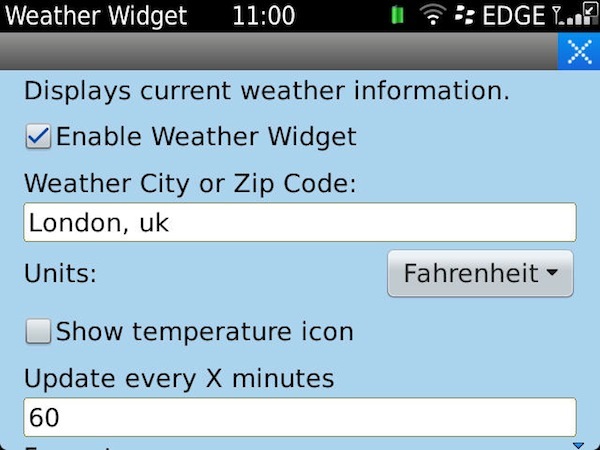 In addition you have option to enable/disable both the notification icon and widget. 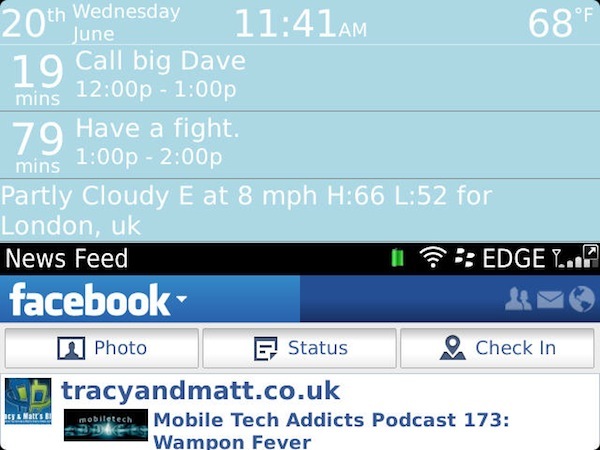 The user interface of the app is pretty basic but this helps simplify things. Everything is set out on a nice light blue background with simple options for you to select. Using the ‘Shortcuts' and ‘Hot Keys' can be particularly useful. 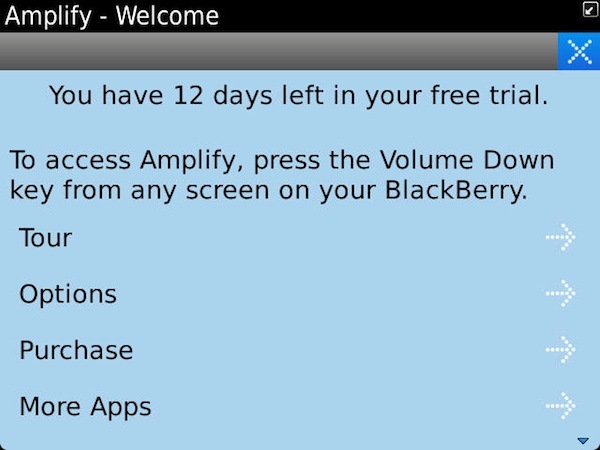 This will allow you from within any application on your BlackBerry access other apps/features using Amplify. The shortcuts option will let you start typing a pre-saved word from within Amplify. 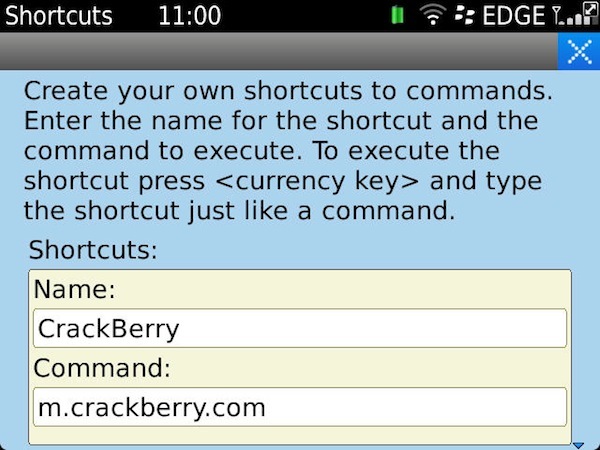 You would have seen in the video how I chose that when I type CrackBerry and press enter, it automatically opens the CrackBerry web page. A handy feature. because remember that you will be doing this while working in another app, which is the whole point of Amplify. The same applies for Hot Keys. Once set up and you have the Amplify status bar open you can hold down the alt key on your keyboard, press the letter key you have chosen and that will create a shortcut. On the video you would have seen I chose the letter C to open up further calendar entries. A nifty feature. When it comes to the weather options there are a few choices to be made. You have the option to choose the units, your city/zip code, temperature icon and most importantly the frequency that the app updates the weather. I decided to go for 60 minutes, as having this option refreshing every few minutes will have an impact on battery life.